How safe is unlock shaders and raise the clocks 840/1325 (CCC overdrive limits)??? Improvement the min FPS, worth for Crossfire, decrease the life time??? I tried both the BIOS mod and the 6970 bios. The 6950 mod simply didn't do anything (tried both switch positions). With the 6970 bios, I think I flashed successfully, but when I restarted my pc it wouldn't load. I don't have a second pc to check it with. I had to flash back by starting my pc with the BIOS switch in 2nd position, and while the pc was running I switched to the 1st. I'm using MSI 6950 Twin Frozr iii Power Edition. Hmm should I try another manufacturer's BIOS, or try modding the previous version of Twin Frozr BIOS? did you try this guide for the Frozr III? When I unlocked shaders with those settings my improvement was around 4 extra average FPS in games like Aliens v/s Predator and Resident Evil 5. In Heaven Benchmark my increment was 1 FPS However, I have not yet valid conclusions about the increase of min FPS (the most important for me). Best of luck with your overclocking endeavors mate. Unlocking shaders doesnt actually give you that big of a performance increase to risk bricking your card now, does it? Unlocking the shaders is an optional free performance upgrade. I haven't heard anyone brick their cards from unlocking shaders. There exists the possibility of a bad bios flash, which won't allow the card to boot. Without a bios switch, it takes a few more steps to correct abd reflash to a working bios. Has anyone had luck unlocking this card? Non-reference 2 GB model, but possibly with no dual-bios switch; i guess it could work, but i wouldn't flash a card with no dual bios frankly Do you have the card or just plan on buying it? Hi, I hope this hasn't been answered too many times... I've read through about 60 pages thus far. Both command display the flashing window with progress bar for a few seconds, before exiting silently. Upon reboot and also uninstalling and reinstalling the drivers, I still show the default number of shaders. Is my bios unflashable or am I doing something wrong? anyhow here i am in the 6950 bios thread. anyhow i just want the CHEAPEST 6950`s that can be flashed to a 6970 and that cfx will still work good. i would have two cards so i dont need a reference card with dual bios do i? anyhow your thought would be appreciated. I followed this guide to flash my 6950 club3d card but things aren't working out for me. The normal process described in the OP did not work, I had to go through the BIOS and do the EXTRA WORK thingie. It said a succesful flash was completed and reboot was nescessary, it also showed me a window with some info in it, things like: new device id and old device id or something. After the reboot me monitor went on and showed INPUT NOT SUPPORTED! Message. I tried a few bios versions: the club3d 2gb 6970 and the xfx/sapphire 2gb 6970 BIOS. All with the same result: "input not supported". This gave me exactly the same results, the flash is succesful but after a reboot the monitor displays a input not supported message. Specs will be below, I hope someone can help me out here! I got exactly the same problem, mine is the Sapphire 2gb non reference model without bios switch, does yours have the switch. Have you tried flashing from a bootable usb device, i alway get the rom not erased message, check my post at top of page 103 for screenie. Having hit performance issues in Witcher 2, I decided to give a go to flashing my launch-day XFX card. Reading this thread, I see that recommendations have quite changed, and instead of flashing a 6970 BOIS, the recommendation now is to re-flash the card with modded original 6950 BIOS that came from the card, then tune the clock speed via MSI AB, correct? On another hand, I see the RBE tool mentioned here several times - so perhaps the best way do all above from RBE? Also, what clock timings/voltages are considered safe? I tried the hp usb boot method with no luck once again on my Visiontek 6950 card. - checked GPUZ, nothing changed. So I'm at a loss as to what's going on. Is there a difference between the .rom and .bin file? I saved my bios in RBE in both positions. The file that was created with the switch to the far right (away from CF, which I understand is bios 1) comes up as an error when I rename it as original.bin and run wizzards patch: "could not find byte sequence in file." Whereas if I load the bios file that was saved from what should be bios 2, wizzards patch runs fine. I came across another thread, either here or somewhere else that had someone successfully flash their 6950 which had the bios switch and aftercooler fans installed. edit - maybe I should just try another vendors bios file found here on TPU. It's still weird if I do one of the other methods where it changes my clock speeds but does not unlock the shaders. I just wanted to add my success to this forum. I had posted a few months ago and wanted to update my experience. I have an XFX 2gb Reference card. I tried a couple of different mods over the months and have the best results with the shader mod using Sapphire TRIXX. Core is 884mhz and Memory 1366mhz. The system runs the most stable with these settings. Unique Heaven was the hardest Bench to set. Furmark and 3D Mark 11 did not present any problems at all. Scores for Unique 1094, 3D Mark 11 5617 Performance preset, Furmark is 2998. Maybe not the highest scores, but good enough for what I do. Hope this helps someone. Im having some trouble unlocking the shaders on my Gigabyte 6950 1 GB. One guy did it before but the other was having trouble, same as me. Has anyone had any luck getting it to work?? Yeah I've still not managed to unlock that Gigabyte card though I'm yet to try the dos usb bootdisk method. On a side note they are sexily overclockable. So far I'm stable at 920/1425 at stock voltage and just a fairly standard fan curve in Afterburner. Hottest I've seen it thus far is 60 degrees and it run witcher 2 at 100% GPU utilization very well without artifacts or crashes. Must be the 3 fans they put on these cards. Best stock card I've ever had anyway. Probably have to restart after applying it, can't remember. I have a Sapphire 6950 1gb non-reference that I tried to unlock the shaders on . BSOD Dead. think I corrupted bios? I was using winflash and had modded a bios using RBE to unlock extra shaders. I had saved the bios as a .rom and I think that may have been an issue? Lucky for me I had just dumped the original bios using the sapphire software Trixx. I restarted using my intergrated graphics and tried to flash with winflash. I keep getting "cannot read Rom " error. after following this link http://www.techpowerup.com/forums/sh...6&postcount=19 using the command prompt and the original .bin bios I managed to restore my card. I tried again to unlock the shaders this time saving the modded bios as a .bin , but with no luck. lucky to still have a working card I guess. this card seems to be hardware locked on the PM25LV010 Flash Memory. you have to use a SOIC8 Clip to bridge the WP# and the VCC pin. cannot read bios error message. 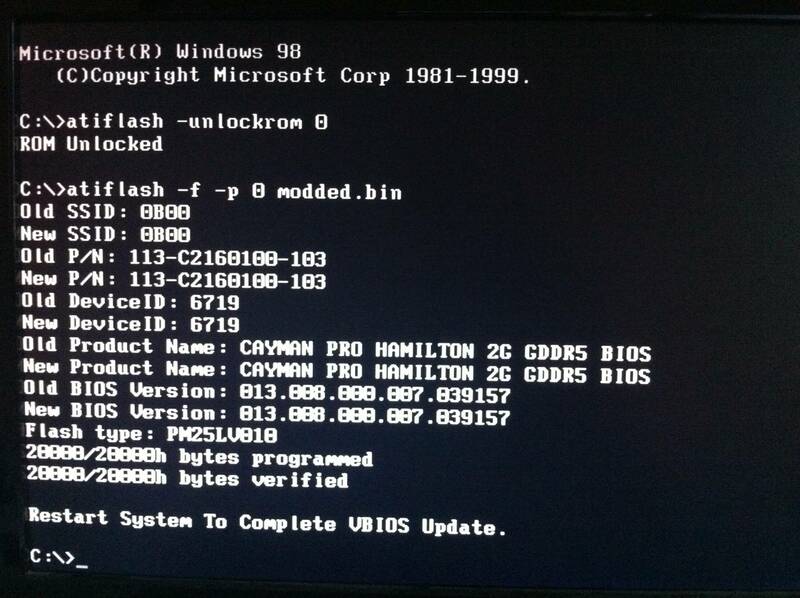 Then working again after attempting to reflash original bios, with unlock command. Yep those Gigabyte 1 GB OC cards are awesome. After unlocking the shaders you may find that you can't O/C it as high, possibly owing to the extra voltage needed for the unlocked shaders? That's what happened to me. I havent tried upping the voltage on it yet tho. It still runs fine at it's factory OC speeds (870/1250) with shaders unlocked. I guess you'd need to decide what gives better performance.. locked shaders at 920/1425 or unlock shaders at 870/1250? The key to flashing that card for me was to 1) save the bios using GPU-Z (not winflash as I read it saves corrupted bioses for some cards) 2) edit with RBE and save 3) flash it using ATIflash from a bootable USB or floppy. It seems people (including myself) are still not having any luck unlocking the shaders on the newer non-reference Sapphire 6950s. So, I ask again, has anyone been successful, and if so, what were your steps? Second question: even though the dual bios switch is not there, I still see the 1 and 2 printed on the PCB as well as the pads to which the switch would have been attached. Would it be possible to solder a switch in there?